Purchasing an exercise machine is the first step toward a commitment to a lifetime of good health, revitalized lifestyle, and exciting adventures. Living out in beautiful Napa in particular can inspire an interest in health & fitness. We have so many lovely places to hike, boat, surf, bike, and many other fitness-oriented activities! One may think that there aren't any good places to purchase top quality fitness equipment at competitive prices locally...360 Fitness Superstore in Napa, California offers a complete line of exercise equipment to all residents of the Napa area and beyond. When you purchase your new fitness equipment from 360 Fitness Superstore you can rest assured that you are getting the best equipment for the price. We have a professional and knowledgeable team ready to help you at our Napa, California Store! Why 360 Fitness Superstore? We're Local, & We have EVERYTHING! Exercise bikes in Napa, California - Stationary exercise bikes are a great lower body workout to gain fitness endurance and tone your legs! A minimum impact exercise bike will allow you to remain comfortable and free from pain while getting a great workout. 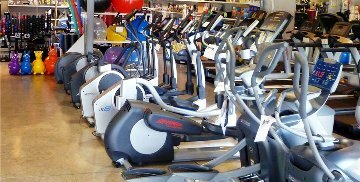 Come and see our many different upright and recumbent bikes in this category at our Napa store. Fitness Accessories in Napa, California- Abs, Core, Balance, Cross Training & WOD -Maximize your workout potential with a multitude of fitness accessories to push you to achieve your fitness goals! Add a yoga ball or a resistance trainer to your home or office gym and give you fitness routine a boost! Check out our variety of accessories from Cross Training / WOD Equipment and yoga mats to medicine balls and foam rollers! Ellipticals in Napa, California - Elliptical Cross Trainers offer the benefit of a low-impact workout while exercising both your upper and lower body. The convenience of an elliptical will allow you to fit a cross-training workout into your hectic schedule. With a top brand elliptical you can achieve a fun, full exercise workout at your Napa home in California. Treadmills in Napa, California A treadmill is the most popular choice for home exercise equipment - they are also effective. Studies found that treadmills ranked number one among exercise machines in burning calories. Using a treadmill for your regular workouts is a great way to burn calories and tone your walking muscles. We have top quality treadmills brands ready!